The following guide covers the basic operations of modules. Hover to locate a module. If the two plus signs appear, adding modules above or below the selected module is possible. No plus signs indicate the module is locked. 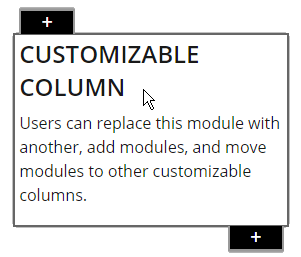 Click to select a module. The module type appears as a label along the top border. Click the blue check mark at the top right corner to deselect a module. Dots on either side of the module label indicate the module is can be dragged and movable. Click and hold on the module label to drag. The Toolbar at the top left corner of the page appears when a module is selected. The text within the module can be edited. In some modules, tools will appear when you hover over links. 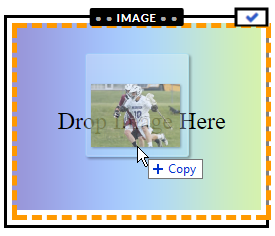 Images may be uploaded to modules by drag-and-drop or via an image menu on the toolbar. 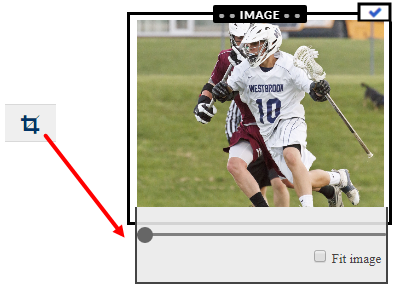 The crop toolbar button for images allows you to zoom and position images.